Today, a new movie on America's renown 16th president is being released in theaters across the globe. The movie has received great reviews and I am looking forward to watching it. Abraham Lincoln is my favorite president. He was a man of strong conviction. A lawyer by training, he was set on from the very beginning to ending one of America's ugliest institutions: slavery. Slavery was big business. It brought a lot of money to landowners who used slaves to toil and work the fields. Any attempt to free slaves was extremely frowned upon for this very reason. Who does not like money? What rich person does not love being rich? "The love of money is the root of all evils..."
"The Declaration of Independence set up a standard maxim for free society, which should be familiar to all, and revered by all; constantly looked to, constantly labored for, and even though never perfectly attained, constantly approximated, and thereby constantly spreading and deepening its influence, and augmenting the happiness and value of life to all people of all colors... " (The Radical and the Republican, p. 62). African Americans, at the time were seen as property, not citizens. They were only 3/5 human beings and were not considered persons in the same regard as white people. With the 3/5's compromise, slaves were counted as only 3/5 of a free white person for the sole purpose of taxation and representation. Because of this compromise, the southern states had more political power. This would bring much discord with the north who did not see it as fair that the south had all this power. The conditions of slavery were not something anyone would love to be in. They lived poorly, were abused physically, mentally, verbally and sexually. They could not vote, own property or speak against white people. The hardships were so bad that many risked it all by escaping. Those who were caught were tortured or hung on trees in order to make an example to those who might even think of escaping. It is hard to believe now in 2012 that this happened in the United States of America. Unfortunately it did and not only here, but in other nations as well. Slavery was everywhere in the union and nowhere mentioned in the Constitution. Euphemisms were used in order to address it. Slavery was not restricted solely to Black people. Whites and also Native Americans were used as slaves. Two kinds of racism existed then: Cultural and Biological. Cultural racism was the idea that groups are different based on how they were raised, culturally speaking. Whites and Blacks are different races because of the values and cultures each possessed which were obviously different. A member of one race can join another only if he/she adopts the culture of the new race. Biological racism was the idea that physical traits such as skin color, facial features and hair texture defined who belonged to a particular racial group. Whites were always seen as superior. As slavery was ending in the north, those slaves still in chains in the south who desired freedom wanted it even more. Blacks in the north eventually were accepted into society. Many of them got educated and had jobs, but still did not have the same rights as white men. It is interesting to note, that women were in a similar situation as Blacks, including white women. They too were seen as property and did not have rights. Only the white male was legally considered the sole citizen of the United States with full protection of the law and with full human rights. In the north, many Abolition Societies organized which sought more freedom for the slaves. They campaigned to end slavery and wrote pamphlets promoting the cause. Ironically, whites and blacks who were against slavery were part of separate abolitionist groups. The Quakers were at the forefront in promoting abolitionism at the time. David Walke, a former slave wrote the book, "Appeal to the Colored Citizens of the World" which was published. In it, he calls for all Blacks to claim their rights as Americans even by using force. Different methods were used to slowly ween American society of Slavery. Manumission was one of them. Manumission was the voluntary freeing of the slaves by slave owners. Virginia, Maryland, and North Carolina were the first to try this experimental method. George Washington was one of the first to do this. He voluntarily freed his slaves. The practice of Manumission would eventually face legal problems as slavery became more profitable and any attack against it was seen as a threat to local economies. The consequence of this was the creation of a large black free population in the northern states that bordered with the south. Conditional termination was proposed, or the idea that slavery would end depending if certain conditions were met. With the election of Republican president, Abraham Lincoln, the tide against slavery would begin to rise. Acts and laws in favor of slavery were challenged. The south began to protest, eventually separating from the union. Lincoln had a hard decision to make. He could either free the slaves and possibly destroy the United States of America, or give in to the south's demands. Where did his hatred for Slavery come from? 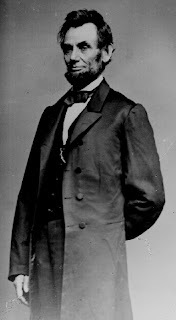 While in his home state of Kentucky, Lincoln's family belonged to the Little Mount Baptist Church. The minister there, Jesse Head, preached to them the evils of slavery. It was religion - Christianity - that instilled the antislavery stance into Lincoln. This is significant because some claim that the Bible supports slavery and that Christianity advocated it. This is far from the truth. The president saw slavery as not only a temporal issue, but also a spiritual one. Slavery was the physical manifestation of evil. Lincoln truly believed God would end it once and for all, and He did. Today we have a new "slavery" - abortion. The unborn, just like African Americans back in the day are disregarded as commodities of the born. Unfortunately, we have no Lincoln who would face the issue head on even if it meant splitting the nation apart. Lincoln was a true leader - a true president. Despite all odds against him; despite facing a Civil war in which at times the Union was losing ground, he stood by his convictions and Emancipated the Slaves. He did the moral thing in immoral times. On January 1, in the year 1863, the Emancipation Proclamation would take effect. Shortly after, the Civil war would end and America would have new life. During President Obama's inauguration in 2008, Lincoln's Bible was used. History seems to repeat itself in that the enslavement of Black people and attempts to free them triggered the Civil war and now the first Black president is triggering a large petition from all 50 states asking to secede from the union due to his policies.